Looks yummy…Can we substitute honey or another sweetener? If anyone reading this now wonders, yes, honey worked. I only used two TBS, since there’s some sugar/sweeteness in the chocolate already, and to keep moisture down. I also made mine with an extra egg yolk. This looks delightful. I’m wondering about the vanilla bean powder…. and could vanilla extract be used instead? I used vanilla bean (scraped seeds out and used those) and it came out great. Only caution with vanilla extract, IMO, is the extra liquid. This was on the verge of too soft as it was for us. Wow! This evens LOOKS decadent! Cannot wait to try it! Thank you for sharing! Happy Anniversary! On my list for tonight! DH bought an extra raw cream this week and now I have a great use for it. Do you think Coconut milk or coconut cream would work as a sub for the cream? We’re still dairy free GAPs here. I think coconut milk would work great as a sub for the cream. Did you try it? This won’t work with coconut or non-dairy milks. Real dairy milk works differently in recipes. You’d have to add a starch – corn, potato, tapioca,etc. – to make it thicken. I’ve been dairy free for years. I’ve tried subbing other milks in recipes like this and it won’t work. Thank you! I’m vegetarian and intolerant to corn products, and haven’t been able to find a pudding recipe without either. Must try immediately! (2) How much xylotol should I substitute? I don’t recommend the use of xylitol. This looks heavenly Jenny!! 🙂 Can’t wait to try it! Why are you doing this to me?! 🙂 I’m trying to cut out most sweets and tame my chocolate cravings and here you post this, lol 🙂 Hehe, very tempting! Ummm, have I told you how much I love you lately? As much as I love the idea of hand crafting chocolates or something special this week, the reality is that our schedule is a bit crazy and it’s just not gonna happen. I’m thinking I’ll make this for the hubs and the caffeine-free honey custard for my littles. Thank you, Jenny! Can we use cacao paste instead of dark chocolate? 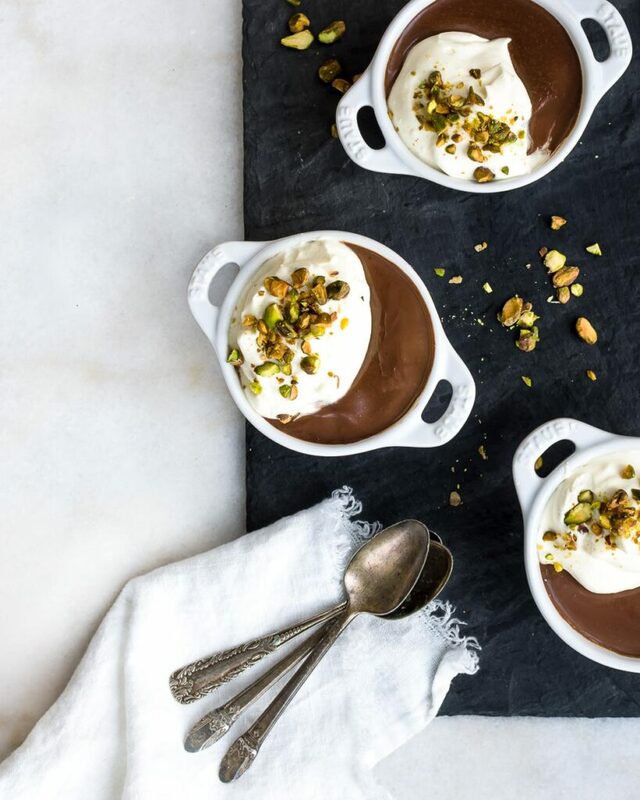 A friend of mine gave me a delicious recipe for chocolate mousse using… Avocados! Blend in a food processor! That’s it! Yummy delicious! Awesome! These ingredients really work for our family, I’m excited to try this! Thank you! Thanks Jenny. 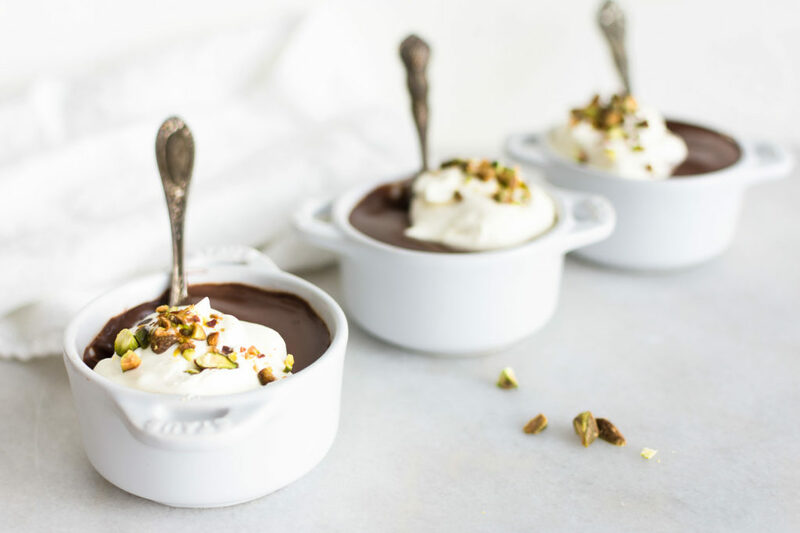 Chocolate pudding is a childhood favorite. I also love chocolate ice box pie. Will love trying this! Happy Anniversary!! Your precious comment about falling more and more in love with your husband made my eyes well up with tears it was so sweet. I feel the same way about my hubby and we’ve been married 28 years! Enjoy your delicious custard and here’s wishing you many, many more years of health and happiness! Ahh.. a custard without the cornstarch and goo! How many portions would this recipe make please? I made it yesterday, and it’s 4 small portions or two large. Yum-o! I would love to make this, but cannot find a good source for raw cream in my area. Jenny, do you have any suggestions for substitute ingredients for unpasteurized cream? Coconut cream perhaps? Made this tonight for Valentine’s Day and it was divine! I used a splash of vanilla extract instead of powder, palm sugar and used heavy whipping cream. Layered it with whipped cream and strawberries in champagne flutes. It was a little liquidy at first but set really well in the fridge. YUM! We DID make this for Valentine’s Day! So delicious and rich! Thank you for the recipe, Jenny! This was so, so good. We even used chili chocolate for an extra kick! Yum. Wow!! This was amazing!! I used 55% dark organic cacao instead as I’m still aquiring a taste for the darker :). New to your site and absolutely loving it!! I’m making this with mint extract instead of vanilla…..smells divine so far!!! Special dessert for the residents’ graduation luncheon, complete with fresh berries and freshly whipped cream! I made this several months ago and didn’t temper the eggs properly and it turned out a little crystallized, I guess is how I would describe it. I was wondering if using vanilla extract versus powder caused it to ‘seize’?? However, it was delicious! I am going to try my hand at it again and am wondering if I can use coconut palm sugar instead? is the 1/4 tsp right? we just tried the finished product & it’s so salty it’s inedible. Delicious! I made this for a chocolate pie filling. I used vanilla extract because I did not have the vanilla bean powder and so used about 1tbsp less cream (I was afraid the extra liquid would prevent it setting properly, not sure if that was a legitimate concern or not). I also used extra large egg yolks. NO trouble with it setting up nicely to a beautiful velvety consistency. I made two batches to fill a 9″ pie shell – absolute heaven! This is incredible on its own as a simple custard, but also wonderful as a pie filling! How do you like to cook your oysters? Might try the link you posted sometime! The chocolate looks so delicious! I will grill oysters or toss them into a chowder. Jenny, thanks for the recipe. What proportions would make a large batch to feed a family? I know some recipes can easily be doubled or tripled but I don’t know how to do that with custard. This made3 small ramekins. There are 6 of us and I’m sure everyone will want servings. Thanks! Should it cool before going in the refridgerator? I put it straight in the refrigerator.